ANKARA — In one of the most critical stages shaping its indigenous fighter jet program, the Turkish government plans to select a foreign partner by 2016, officials said. The foreign partner would be expected to support the approximately four-year planned designing phase of the program dubbed F-X, the officials said. One senior procurement official said the contract involving the foreign partner would be around US $1 billion. "These potential bidders have expressed their interest to our request for information. There may be others that can come into the bidding picture at the request for proposal stage," said the official. One potential bidder, US-based SNC, in May won a Turkish contract for the redesign, development and production of an initial batch of 50 regional jets with civilian and military use. The contract, estimated at between $1.5 billion and $2 billion, aims to produce indigenous Turkish jet and turboprop aircraft based on SNC's Dornier 328 and 628 platforms. Procurement officials expect the F-X program to gain pace after parliamentary elections June 7. "This is a program that goes with the tag 'priority,'" said one official familiar with the program. 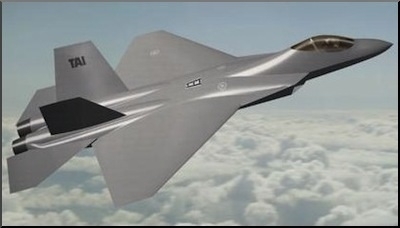 SSM defined in the RFI document the scope of the fighter program as "indigenous design, development and production activities of the first Turkish fighter aircraft to meet Turkish Armed Forces' next generation fighter requirements and replace the existing F-16 fighter fleet starting from 2030s." SSM officials said the release of the RFI document was intended "to see which companies would be willing to take part and which capabilities will be offered." A joint committee of Air Force and SSM officials has already started work on the program at an office building belonging to Tusas, Turkey's aerospace company. Turkey's top procurement panel, the Defense Industry Executive Committee, chaired by Prime Minister Ahmet Davutoglu, decided Jan. 7 to go ahead with the F-X program after reviewing its feasibility. Other members of the committee are Defense Minister Ismet Yilmaz, Chief of Military General Staff Gen. Necdet Ozel and chief procurement official, Ismail Demir, head of SSM. Davutoglu said that a twin-engine model would be pursued in the national fighter aircraft program. But procurement officials say this [twin-engine] is not an "irreversible" idea.